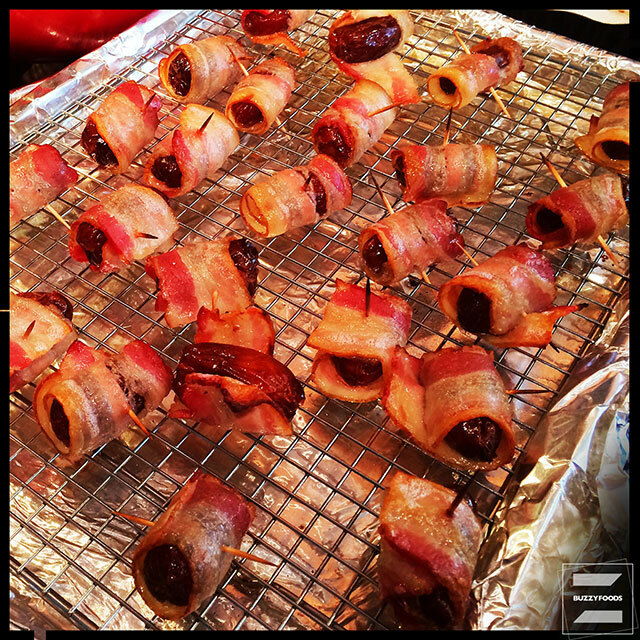 It doesn’t get much easier – or tastier – than this: dates, wrapped in bacon, then baked in a hot oven until the bacon is cooked through and almost melting into the fruit. Yeh, you could stuff the date with an almond, or a bit of cheese – heck I’ve done it myself – but you really don’t need to; the two are pretty spectacular just on their own. I was actually a little surprised when folk started asking for this recipe, thinking I’d done something special or used a secret buzzyfoods date or something. A small box of Medjool dates from Target, and a package of uncured bacon from Trader Joe’s. 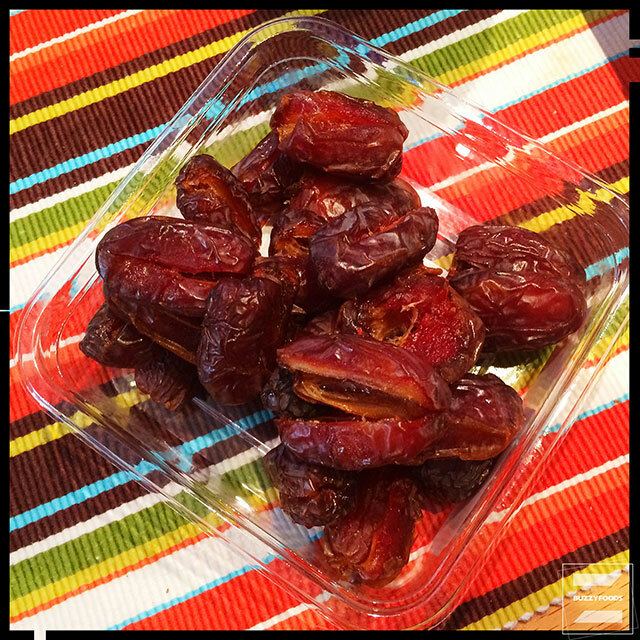 First, slice into the dates and remove the pit, your fingers will get sticky, but that’s the price you pay for yummy. Next, cut the bacon in half. Wrap a half strip of bacon around a date and secure it with a toothpick. Repeat with the remaining dates and bacon. My 12 ounce packet of bacon cut down the middle wrapped all of the dates in my small box with one half-strip left over. When ready to cook, heat your oven to 425º. Apply cooking spray to a rack fitted into a foil lined baking pan and arrange the dates in a single layer. 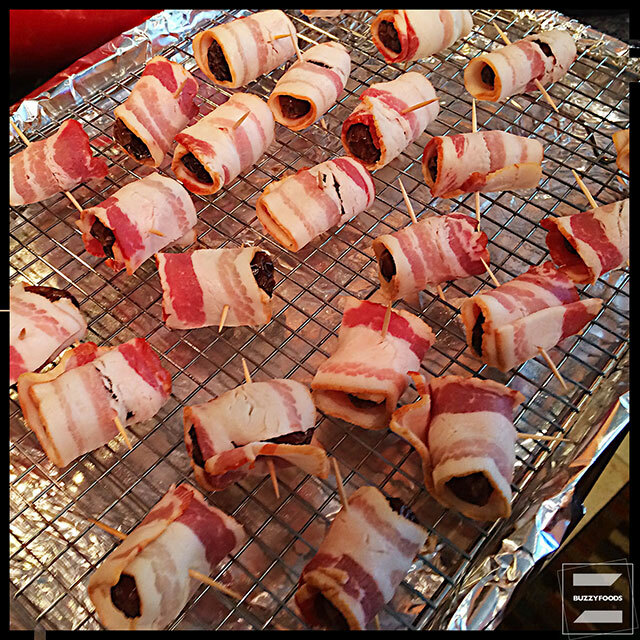 Bake for 15 or 20 minutes, until the bacon is cooked and a bit on the crispity side. See? Doesn’t get much easier than that! Plan on adding these stress-free little bundles of goodness to your next gathering or feast day table. This entry was posted in Appetizers/Munchies, Parfait! and tagged Appetizer, Bacon, dates, Munchies, Parfait! 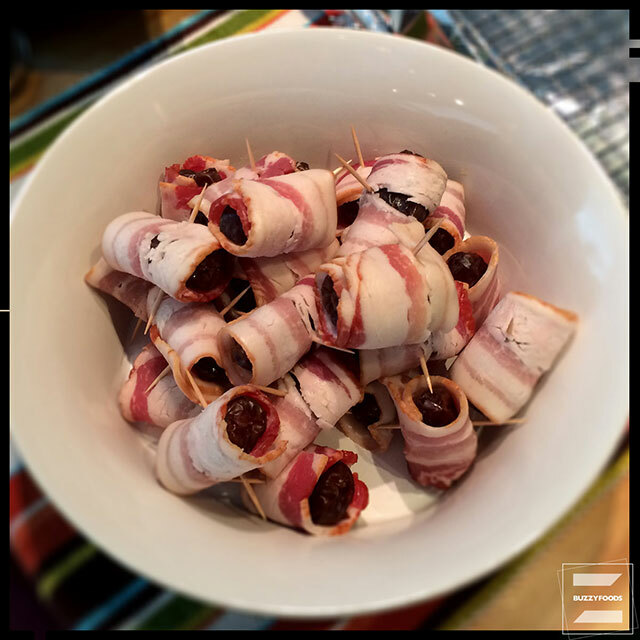 Bacon Wrapped Dates, Thanksgiving. Bookmark the permalink.